The women and men coming up through the ranks in the U.S. floor covering business are not only contributing to the growth of the industry but are also introducing new and innovative products and services that are revolutionizing the business. Made up of executives, salespeople, designers, product engineers and craftsmen, these hardworking professionals are making waves-and this year’s winners are no exception. This year, the Future Focus awards from Floor Focus recognize the best of the up-and-coming talent within the dealer/retailer/contractor sector in the flooring business. The candidates were an exceptional group, and it was difficult to narrow the field to ten winners. Our judges are industry veterans Ralph Boe and Paul Friederichsen. 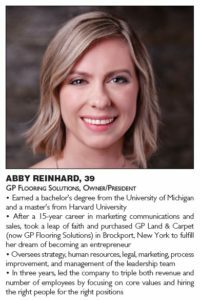 Congratulations to the Floor Focus 2018 Future Focus award recipients, one of which was our President and Owner, Abby Reinhard!